In recent years, the International Association of Language Centres (IALC) has published a series of studies that contribute to our understanding of the global language learning market. The latest of these is the IALC Study Travel Research Report 2017, and is entitled The student perspective on language study abroad: Student expectations, experiences and satisfaction. The study was released this week at the ICEF Berlin Workshop and it reflects the findings of a global survey that gathered 4,755 responses from 136 countries. The survey was conducted from January to March 2017, and all respondents were current or former students enrolled at one of 140 IALC member centres. One of the top-line study findings is that the vast majority of responding students relied on three main sources of information when searching for a language school. As the following chart reflects, nearly one third (32%) said that the school website was their primary source of information. 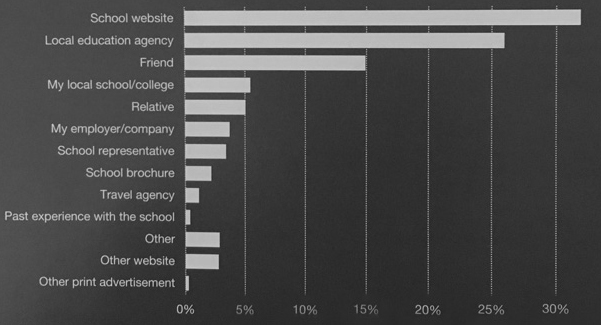 Another 26% cited local education agents (that is, agents operating in the student’s home country) as their main source. And about 20% relied on recommendations and advice from friends or family to guide their choice of school. The survey also indicates some variation in information sources by student age. Younger students, for example, were more likely to rely on local education agents as their primary source of information. As students age – from about age 25 and older – the mix gradually shifts to a greater reliance on direct information channels, and the school website in particular. Recommendations from friends also played a more prominent role with older students. As its title suggests, student expectations are a focal point of the study and the findings reflect both how the students’ experiences matched their pre-arrival expectations as well as how well their expectations were met overall. The survey zeroes in on the accuracy of information provided to students as a way of checking pre-arrival expectations. And for the most part students reported that on arrival at their school most of what they experienced matched very well with the information they received beforehand. Importantly, nearly 95% of respondents said that the information they received on pricing and fees was reliable. A similar percentage reported that they also received accurate information on school location, facilities, and accreditation. Some aspects of pre-arrival information – notably the use of technology in the classroom, the nationality mix in the school, and the number of extra-curricular activities and excursions – were more likely to be the subject of misaligned expectations. In each of these three areas, roughly 10–12% of respondents indicated the information they received in advance was inaccurate. The study also found a correlation between information source and information accuracy in that students who relied more on indirect sources, such as local agents or friends and family, were roughly twice as likely to report inaccuracies (in the three categories noted above) when compared to those who relied more on a direct source, such as the school website. The survey also asked students how well their expectations were fulfilled across 20 different aspects of their language programmes. These ranged from school atmosphere to teaching to school facilities and accommodations. Overall, 30% said that their expectations were exceeded. Another 45% reported that their expectations for their language programmes abroad were met. To sum up, school atmosphere, teaching, and ease of application process were the most highly rated aspects overall. Students also indicated very high levels of satisfaction with course content, school appearance, and support services. On the other side of the coin, as the report notes, “If the research intimated any opportunities for possible improvement, these were largely tied to out-of-class activities. Students also anticipated more value in making friends in the country of their study, opportunities to practise outside class and nationality mix.” Accommodation was another area of wider concern with one in five respondents indicating that they would opt for a different accommodation option if they had it to do over again. When asked to rate their satisfaction with their progress in building their language skills abroad, most students reported making more progress than expected. This entry was posted in Africa, Asia, Australia/Oceania, Europe, Middle East, Most Popular, North America, Regions, Research, South & Central America and tagged language enrolment, foreign language, Most Popular, language schools, language students.